My friend forwarded this to me through email, not sure where is the original source, so who happens to know the author of the WORK, please leave your comment here. 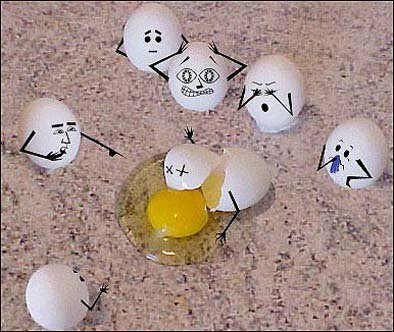 I like this picture so much, you can even put the script to the eggs, “Oh my God, he committed suicide”, “I don’t want to see” , “how could this happened” , “I am so sad” and etc. Leave your caption of Mr. Egg here, to see who has the most creative idea. "I told you it was Flu!"